From Robin Ficker’s Twitter account. 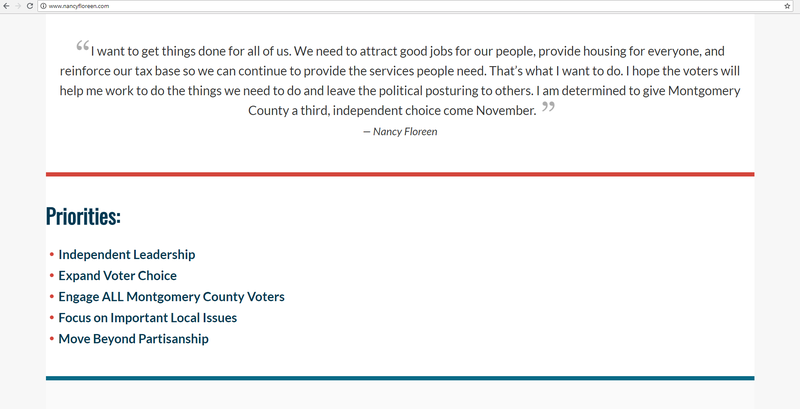 Council Member Nancy Floreen, who is trying to get on the ballot as an independent candidate for Executive, has launched a new website for her run. The site is short on details right now but many candidates launch starter sites early and expand them later. Also, Floreen opened a new campaign finance account on July 3. Its chair is Sally Sternbach, a former Executive Director of Rockville Economic Development Inc. and a former Acting Director of the county’s Department of Economic Development. Its treasurer is Joyce Fuhrmann, who was once Council Member Mike Knapp’s Chief of Staff and is a former Vice President at the Montgomery County Economic Development Corporation. Below are three screenshots from Floreen’s new site. Could Ficker Win a Three-Way Race for Executive? There is much condemnation of Council Member Nancy Floreen among Democratic activists for leaving the party and launching an independent run for Executive. Some of the outrage is related to party loyalty. Some of it is related to support for the apparent Democratic primary winner, Marc Elrich. And some of it is related to Floreen’s record in office and historic support by the business community. Those are all value judgments best left to the readers. 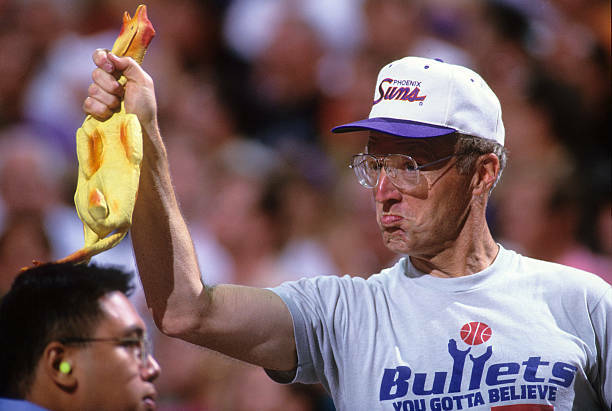 But one concern can actually be evaluated with data – the notion that a Floreen candidacy could enable GOP candidate Robin Ficker to come up the middle and squeak out a victory. Could that actually happen? Ficker, who has a long and infamous history in the county, has been running for office since the 1970s. He was actually elected to a District 15 House of Delegates seat in 1978, a decision reversed by the voters four years later. Since then, he has run for offices of all kinds and placed numerous charter amendments on the ballot. Two of his charter amendments – a property tax limitation measure in 2008 and a term limits measure in 2016 – were passed by county voters. 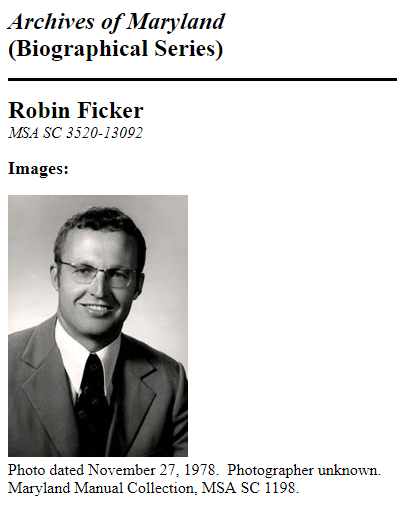 Robin Ficker’s official House of Delegates picture from 1978. Forty years later, could he be headed to elected office again? Besides all the losing, the thing that stands out here is Ficker’s unpopularity in the Republican Party. He has entered six contested GOP primaries since 1994 and lost five of them. The only time he had opposition and won was when he ran in the 2009 County Council District 4 special election and defeated two no-name Republicans who barely campaigned. The lesson here is that when Republicans have an alternative to Ficker who is not a Democrat, they tend to vote for someone else. Even Republicans are reluctant to buy what Ficker is selling. Photo credit: Getty Images, John W. McDonough. When he did make it to general elections, Ficker earned vote percentages ranging from 34% to 41%. But most of those elections occurred in Upcounty districts where Republicans are a much larger percentage of the electorate than the county as a whole. Now let’s look at the performances of GOP candidates for County Executive over the last five general elections. One of the untold stories in MoCo elections is the recent decline in electoral performance by Democratic nominees in MoCo Executive general elections. From 1998 through 2006, the Republican nominee did not crack 30%. In the last two elections, the Republican got 34% of the vote. For the most part, these were protest votes as the Republican candidates had no money, did not campaign and were not expected by anyone to win. Another thing to note is that the only one of these elections that had an independent candidate was 2006, when Ficker ran against Ike Leggett and GOP nominee Chuck Floyd. Ficker got just 9% of the vote, another sign of his unpopularity with both Republicans and independents. Finally, let’s consider turnout by party in MoCo mid-term general elections. Over the years, Democratic turnout percentage has edged up gradually, independent turnout has increased and Republican turnout has collapsed. At some point, it’s reasonable to expect that independent turnout might exceed the GOP. For Ficker to win, he would need to hold onto all the GOP votes, win more than 70% of independents and have Floreen and Elrich split everyone else exactly down the middle. That would result in Ficker getting 34% of the vote and Floreen and Elrich each getting 33%. That’s extremely unlikely for two reasons. First, as detailed above, Ficker is weak among GOP voters and Republicans and independents would have a viable alternative in Floreen. Second, for this scenario to work, almost half of all Democrats would have to vote against their own party’s nominee to keep Elrich at 33%. It’s easier to see a path to victory for Floreen, who could win by getting half the Republicans, all the independents and roughly 28% of the Democrats. Just to be clear, we are skeptical that anyone can defeat a Democratic nominee in a MoCo countywide election. But whatever the ramifications of a possible Floreen independent run, we’re pretty sure that one of them will not be a victory by Robin Ficker. Council Member Nancy Floreen has announced that she is gathering petition signatures for an independent run for County Executive. We reprint her statement below. Although the unofficial returns of the Democratic primary for County Executive are in, those results have not yet been certified by the Board of Elections. Given the tiny margin in unofficial returns, I am also aware that a recount of the ballots is likely. Notwithstanding all this, I am today announcing that I will be circulating nominating petitions for the office of County Executive for the November general election beginning today. 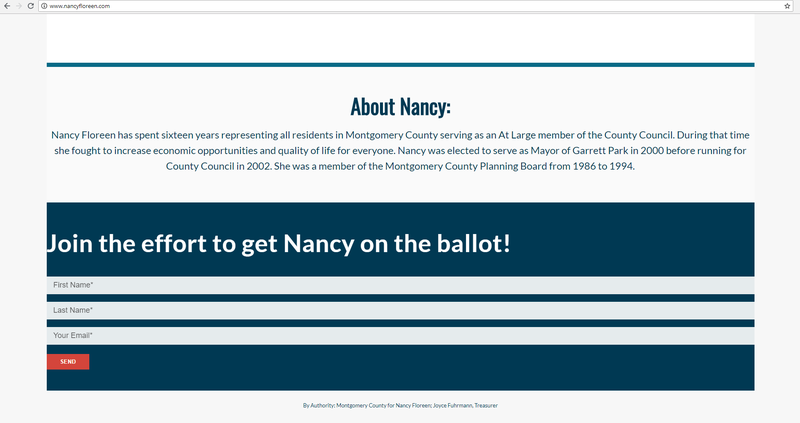 I have been part of local government in Montgomery County for most of my career – as a member of the Maryland-National Capital Park & Planning Commission, as mayor of Garrett Park, and then as a member of the County Council for 16 years. In this county, local government has always been about listening to people’s problems and figuring out the most effective and most efficient ways to help them. It has never been a partisan process, and it has built a great county. I am a candidate for County Executive – unexpectedly, I admit – because it would be a terrible loss for this county to fall into the sort of polarized posturing that has poisoned our national politics. That’s not my way. I want to get things done for all of us. We need to attract good jobs for our people, provide housing for everyone, and reinforce our tax base so we can continue to provide the services people need. That’s what I want to do. I hope the voters will help me work to do the things we need to do and leave the posturing to others. The critical interests of Montgomery County families are ill-served when any candidate can prevail with barely 29 percent of the one-third of Democrats who turned out, the Republicans had no choice at all, and the county’s 150,000 independent voters were prevented by law from voting in either contest. There is no mandate here. Most county voters have yet to be heard from. That is why I am determined to give Montgomery County a third, independent choice come November. I am heartened by the positive response this effort has already won. I call upon all Democrats, independents, and Republicans to say “no” to both flawed extremes, to think for themselves, and to put principle and pragmatism above purely party politics. Montgomery County deserves no less. For more information, contact Sarah Van De Weert at s.vandeweert@gmail.com. 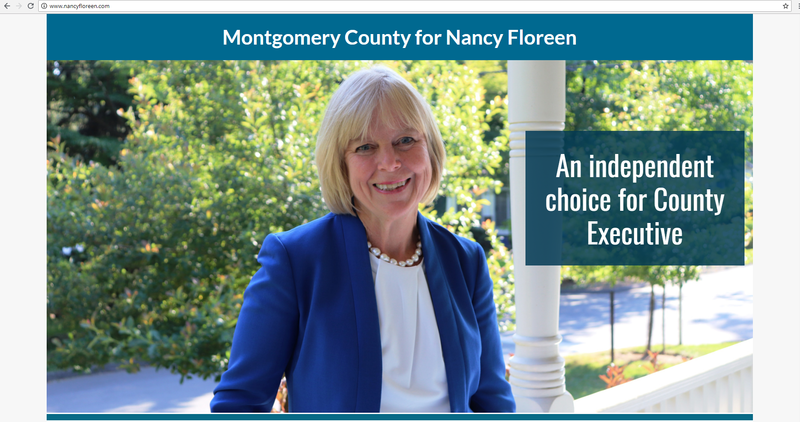 As has been previously written both here and in Bethesda Magazine, Council Member Nancy Floreen faces two hurdles in getting on the ballot as an independent candidate for Executive. First, there is the question of whether she can change her registration from Democratic to unaffiliated in time to access the ballot as a non-Democrat. That issue is playing out now. Second, she faces a petition signature requirement. That’s going to be tough. State law requires that an independent candidate seeking to get on the ballot for a general election must gather a number of voter signatures equal to the lesser of 10,000 or 1% of registered voters by the first Monday in August (which is August 6th this year). In Floreen’s case, the relevant number is around 6,500. That might seem doable EXCEPT that state law is very exacting on how petition signatures are evaluated by boards of election. Among the requirements are the following. Petition circulators do not have to be registered voters or even residents of Maryland, but they must be at least age 18. Circulators may be paid but petition signers may not be paid. 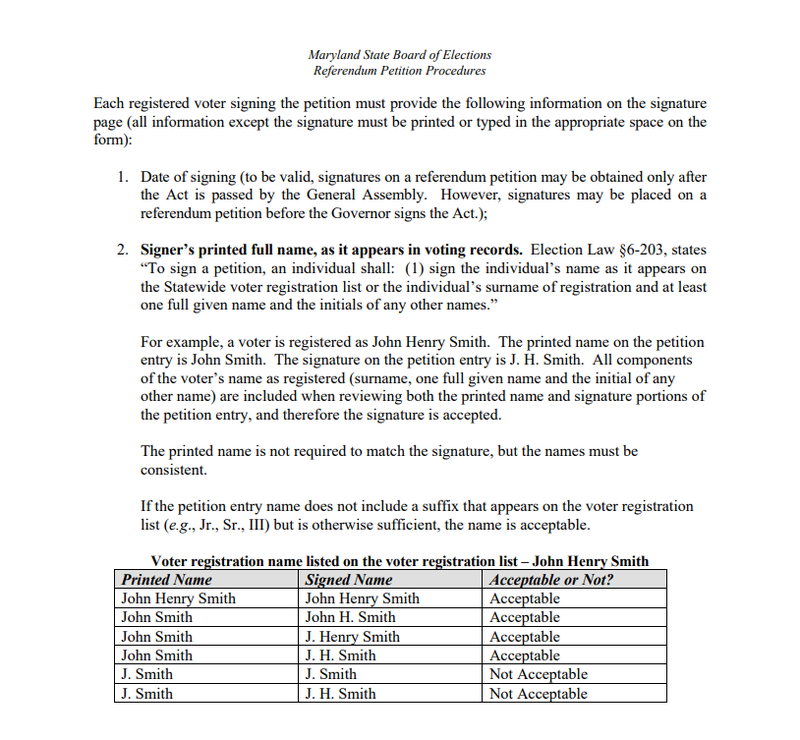 Based on the circulator’s best knowledge and belief, each signature on the page is genuine and each signer is a registered voter in Maryland. The circulator must sign and date the affidavit. Any signature on the page that is dated after the circulator’s affidavit is invalid. Smudged and/or illegible signatures are rejected so signing in pencil is discouraged. A voter may not sign a petition more than once. Voters may not sign on behalf of their spouses. Signers must provide the full month, day and year of signing. The circulator should not fill in that information unless the signer asks for help. Ditto marks are prohibited. The signer’s current permanent residence address must be provided. Business addresses are not permitted. Post office boxes are permitted only if there is no street and house number designation for the voter’s residence and only if the post office box address is on record with the election office. For example, if a voter is registered as Margaret Hall Smith, it is permissible for her to sign as Margaret H. Smith or M. Hall Smith. But M.H. Smith or Margaret Smith is not permissible and will be invalidated. Additionally, the use of her nickname, Peggy Smith or her married name Mrs. John Smith will be invalidated. If a voters’ registered name has a suffix (i.e. Jr., Sr., III, etc.) the signature will not be invalidated if the signer fails to include it on the petition. The State Board of Elections’ procedures manual for petitions provides further discussion of this. If this seems daunting, well, it is. 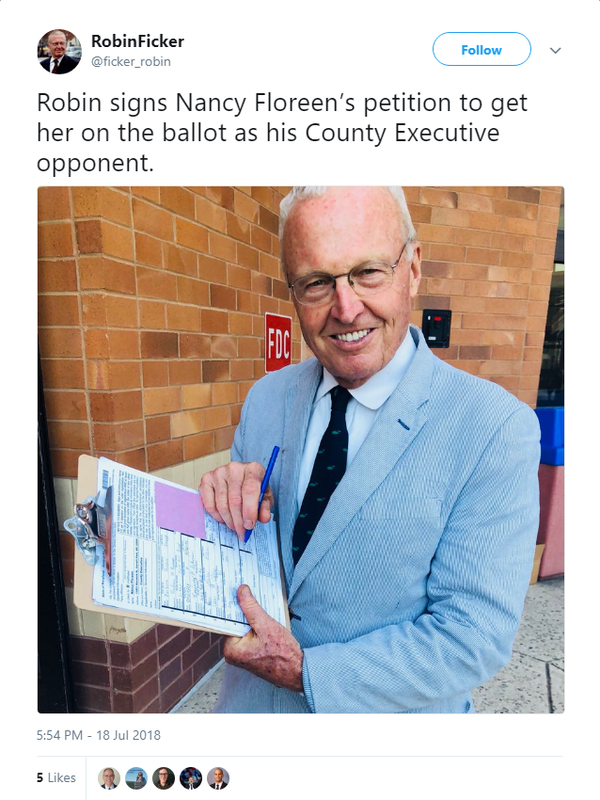 Consider the recent experience of MoCo’s greatest petition circulator of all time, Robin Ficker, who has gathered hundreds of thousands of signatures over the last four-plus decades. It took Ficker more than a year to gather over 18,000 signatures for his 2016 term limits petition, of which 12,573 were ultimately verified by the county’s Board of Elections. Yes, others besides Ficker gathered some of the signatures, but Ficker supervised the effort. If the greatest of all time has an error rate of approximately one third, what would the error rate be for any new or paid circulators retained by Floreen? She is going to need a LOT more than 6,500 signatures to survive scrutiny by the board of elections and, possibly, the courts to make it on the ballot. Plus the fact that the petition is due on August 6 – less than a month away – puts immense pressure on the whole process. Nancy Floreen needs a great election lawyer. Now. She needs a significant number of circulators who are trained in the State of Maryland’s petition requirements. Now. They need to be on the streets gathering signatures. Now. And she needs many thousands of dollars to pay for all this. Now. Or else she won’t be on the ballot. Bethesda Magazine just reported that Council Member Nancy Floreen has filed her intent to run for County Executive as an independent. But getting on the ballot is not as simple as filing. The number of registered voters required to satisfy the requirements of paragraph (1) of this subsection shall be determined as of January 1 of the year of the primary election for which the nomination is sought. The state’s voter registration report for January indicates that there were 644,179 registered voters in Montgomery County at that time. So Floreen’s absolute minimum threshold would be 6,442 MoCo voters. To be safe, she probably needs at least 10,000 signatures to account for inevitable disqualifications. She has until August 6 to get them. Today I filed an Intent to Declare Candidacy with the Maryland Board of Elections to run for County Executive in the November general election. Let me be clear: I would like to have waited for the final count of ballots in the County Executive race. However, State law sets July 2 as the deadline for declaring an independent candidacy. I did not support either David Blair or Marc Elrich. Whichever candidate prevails in the count will do so with less than 30 percent of the third of Democrats who voted — a fraction of a fraction. That’s less than 40,000 votes in a County of more than a million. I believe ALL Democrats, Republicans, and independents would benefit from a third, independent choice. I will announce my final decision on candidacy once all the primary votes for County Executive have been tabulated and certified. Montgomery County’s Charter lays out the County Executive’s powers and responsibilities. The best known include nominating department heads, drafting recommended operating and capital budgets, vetoing legislation, representing the county in public and in Annapolis and directing the operations of county government. It’s a powerful office. But the least known, and one of the most interesting, powers of the Executive doesn’t appear in the charter and has not been used in more than thirty years. If it is exercised by the next Executive, its use could have a significant impact on the county’s future direction. Land use is a huge issue in county government. It is largely the province of the County Council and the Planning Board. The board makes many recommendations to the council on master plans, zoning, impact taxes, transportation projects, its own agency budget and numerous other matters. In serving in its advisory capacity, the board’s recommendations are subject to final action by the council. But the board has its own powers too, especially in deciding preliminary plans, site plans and other development applications. Individual projects need to conform to applicable master plans, statutes and regulations but it is the board that decides how and whether they do. That’s an enormous amount of authority resting with the board. The County Executive can veto Planning Board appointments. Maryland Land Use Code Ann. § 15-103, which we reprint below, lays out the process by which Planning Board appointments are made. 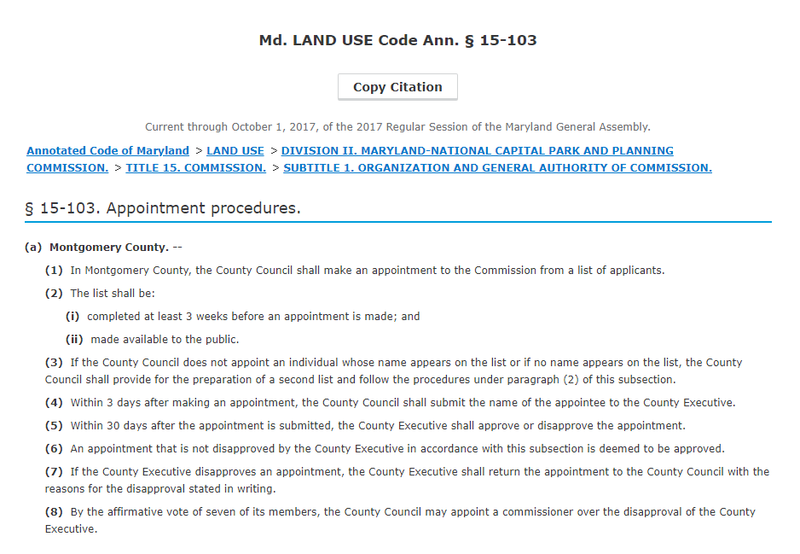 Note that SEVEN of the nine votes on the County Council are required to override an Executive’s veto of an appointment. Under the county charter, six votes are required to override an Executive veto of a bill or budget item. The Executive is not commonly regarded as a major player in county land use decisions as the County Council and the Planning Board have direct authority over them. But a determined Executive would only need three allies on the County Council to exert control over the Planning Board through his or her veto power. Such control would not be absolute; the Executive can only veto whereas the council alone can nominate. But it’s easy to see how Planning Board appointments could be high stakes, political confrontations in such a scenario. And when politics gets involved, well… who knows what could happen? The point here is that an Executive’s land use views matter and he or she has the power to make them stick. Whatever your views on the subject, that is worth remembering in the voting booth.